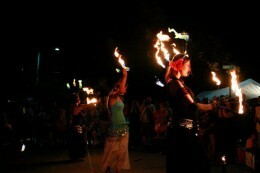 Recent Wright State graduate Lara Donnelly is one of three Raiders in the fire dancing group Soul Fire Tribe. By the time they’re in college, most people know not to play with fire. But I haven’t figured it out yet, and neither have Wright State students Astrea Taylor and Anthony Powers. The three of us, plus companion Andrea Huston, spent the weekend of May 10through 13 at Kinetic Fire, a regional festival for Midwestern fire performers. 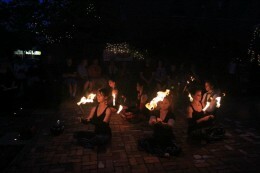 We learned new tricks from international fire-dancing stars and even walked on hot coals. We are part of a local fire performance group called Soul Fire Tribe, made up of seven performers skilled in various fire props including hula-hoops, staffs, fans and poi, a Maori tool consisting of two chains tipped with Kevlar weights that are spun in rhythmic patterns. Working so closely with fire is risky, but it’s also a thrilling experience. Bad burns are not unheard of, but we’re all safety trained and willing to risk some crisped skin for our passion. “Being surrounded by fire is a very engaging experience,” said Taylor. “All thoughts vanish and it’s hard to see anything outside of the fire.” She compares it to meditation. I like the sounds the fire makes, and the sensation of working so closely with something so many people stay well away from. 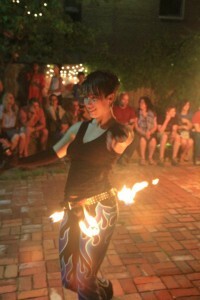 It’s strange to meet other fire performers who are not so awed by the mere fact that I am so close to an open flame. But meeting other fire performers has major benefits: learning new skills, swapping tricks and bonding over shared experiences. When Kinetic Fire set up shop in College Corner, Ohio, we knew we wanted to go. Taylor spent several years touring the country with the performance group Illuminations before she moved to Dayton. 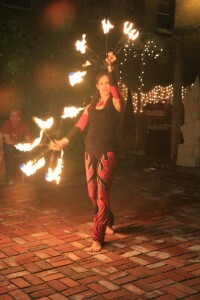 She has been performing with fire for 10 years. “I have been watching some of the instructors for years on the internet and they are my personal heroes,” said Taylor. Once we got to Kinetic Fire, all four of us learned new skills with poi, staffs and fans. We also played on a slack rope, a lyra and aerial silks. On the last night of the workshop, Powers and I signed a dire-looking waiver so we could learn to walk on hot coals. We really did dance the Hokey-Pokey. Then they brought in live drummers and everyone who was planning to fire walk ran around a field for 15 minutes, clapping and singing and dancing until we all entered a state of hyper-awareness. There’s not a lot of mystery to walking on hot coals—at least not to the actual act. You just do it. “When I first stepped onto the coals I was astonished, and then delighted, and then amazed. It was pure, unadulterated fun,” said Powers. What is mysterious is that no one knows how it works—why human beings can step onto a bed of 1,000-degree coals and step off with feet intact. There are many theories, some more reasonable than others, but nothing conclusive. While some people say that fire walkers can remain unburned by moving quickly across the coals, Powers stood still for nearly 10 seconds. The other performers grinned back, cheering him on. Complete strangers gave him bear hugs when he stepped off the coals. You can catch Soul Fire Tribe in June at Yellow Springs’ Third Friday Fling in the Springs, or visit their Facebook page or website: http://www.soulfiretribe.com.